The Official Guide for Grand Teton, Yellowstone and Jackson Hole! 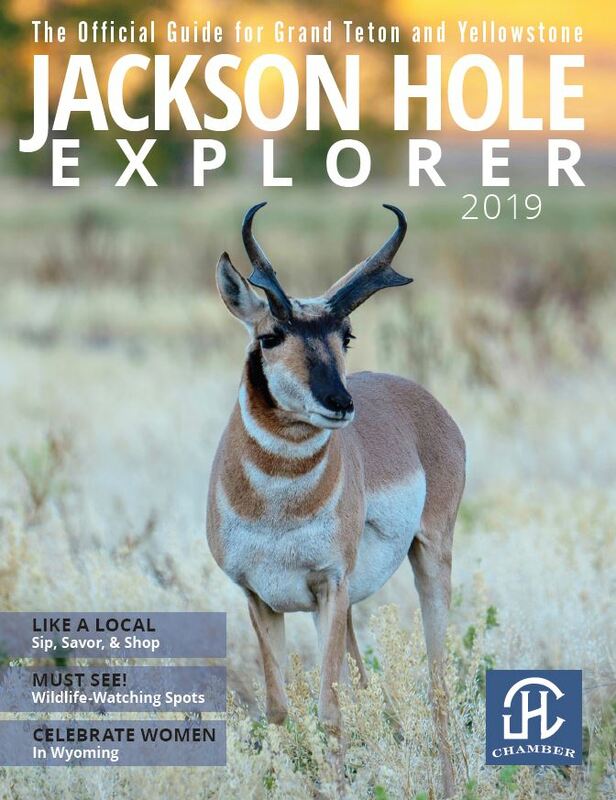 Please enjoy the 14th edition of our annual Explorer Magazine, your official guide for Jackson Hole and the Greater Yellowstone Region! In this year’s edition, You will find stories that showcase our culture and community values through the dynamic history of how Wyoming trail blazed the way for women’s suffrage 150 years ago and the Wyoming women who are blazing trails today. Whether you are looking to experience our Wild West heritage, explore the secret seasons of spring and fall or enjoy the majestic beauty of a real wild winter, the Explorer highlights it all. The 2019 issue features favorite wildlife viewing locations from the lens of the locals who find thrilling adventures in our very own backyard. We encourage visitors to treat our community with respect so that together we can protect our priceless resources and “Keep Jackson Hole Wild” for future generations. The Jackson Hole Chamber of Commerce is pleased to help guests plan their visit and guide them while in town to have the most memorable experience imaginable. Our visitor centers are the first point of contact for more than half a million individuals each year, who are full of questions and eager to explore all that our area has to offer. The Chamber’s professional Visitor Services agents personally distribute the travel planner and ensure vacationers have an unforgettable adventure. The 60,000 copies are present at every local and regional visitor center, as well as national and international trade shows. View the online PDF version for free here! Would you like more assistance with your visit to Jackson Hole? We’re happy to help! Contact Us and one of our qualified visitor services agents will contact you with additional resources. We're also happy to send you a copy in the mail. The Explorer is FREE, though we charge a $4.25 shipping fee through PayPal. Please allow one to two week processing time. Or, order the Deluxe Edition! This edition includes a variety of other customizable collateral. The Deluxe Edition is FREE also, though we charge a $9.00 shipping fee through PayPal. Call 307.733.3316 for details. Please allow one to two week processing time for each. When Are You Traveling to Wyoming? Would you like to receive monthly emails from us?